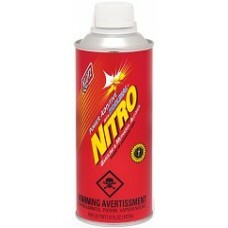 Klotz Nitro is a power additive designed to extract the maximum level of horsepower from stock and modified engines. Improves throttle response and acceleration. Contains 50% Nitropropane and 50% Koolinol as a blending and cooling agent. Blends with gasoline and methanol alcohol. May not be a legal power additive in sanctioned racing events.Use this Additive for Automotive, Kart, Marine, Motorcycles, Snowmobiles and more!